and Central America, where the plant probably originated." The following report has been assembled to highlight an alternate method of Papaya production for export, namely dehydration of papaya. At present dehydrated Papaya is not produced in Belize. Papaya is becoming increasingly a popular fruit on world markets. I have included here references to the "Health Food" aspect of Papaya so that this sudden market growth can be more fully understood by producers here in Belize. It is extremely important to understand, that a health food product is not a major consumer product due to taste and appearance, but rather for the medicinal properties it contains. Papaya is simply an incredible fruit in this aspect, not even closely equaled by another. Yet, today in Belize, the product being exported is not the local Papaya, with its superior medicinal properties, but an imported variety, that is not resistant to local insects, not capable of thriving in local soil, and not happy with local climate. This costs the farmers dearly in that they need insecticides, fertilizer, and irrigation (pumps and gasoline). None of which is a product of Belize so all must be imported. This means, if there is a crop failure, not only does the farmer lose his labor, but the national deficit is increased -- risky business indeed. 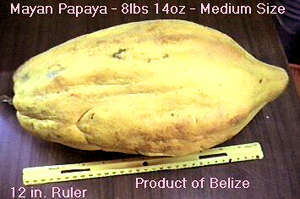 Many attempts over the last twenty years have been made in Belize to export fresh papaya. To date, this style of agricultural business venture has not been profitable yet every couple years the farmers are asked to take the gamble again. The reasoning behind raising this costly and risky papaya is that the consumer in the USA will not buy our large, local, Papaya for prices as high as $3.50 US per pound at their local store, just to watch it rot in their refrigerator before they can consume it all. So the small Hawaiian papaya is the only papaya grown for export. Can we sell the large local papaya? Yes, but we must change strategy. When I once asked a government man why we do not process our local Papaya through dehydration, he answered, that the government of Belize had been advised that to dehydrate papaya was very difficult and the machinery required would cost over 250 million dollars US. This is not so. I dehydrate papaya all the time. It is a very simple process. Of course, if you asked for US aid to design, build, a bakery, they would tell you that it would cost 100 million dollars. The bakeries in Belize, that do that job now surely did not cost anywhere near a fraction of that amount yet the bread tastes just as good! Papaya dehydrates at a ratio of 12 to one. That means 12 pounds of fresh ripe papaya will yield 1 pound of dehydrated product. This product, when packed in a nitrogen atmosphere, will keep for five years. It can be ground to a powder and sold to food processors world wide, as an ingredient in juice drinks, for example. I can easily build here in Belize, without importing any specialized machinery, a dehydration unit capable of turning out one ton of finished product per week (That would require twelve tons of ripe papayas per week) for a cost less than $10,000 US in equipment. This unit's only requirement is butane to fuel the process. It is true that there is a processing cost, which is in the form of labor required to process the ripe papaya from a large round fruit into clean slices which must then be carefully placed on racks and later taken down and packed or ground. But most economists would agree that spending money on local labor is preferable to spending on imported insecticides, imported fertilizers and imported Brigs and Stratton powered irrigation pumps plus the petrol they must consume. Dehydrated papaya is very cost effective overall when transportation and spoilage costs are factored in. Transportation costs drop by twelve times, and loss due to spoilage no longer occurs. The second part of this paper will look more deeply into the effectiveness of the dehydration process, which has been adopted successfully by many tropical, fruit producing, countries around the world. I always like to show people the bottle of orange juice I bought last year in Cancun, that was bottled in Florida using dehydrated orange pulp from Brazil. I think the message is quite clear!! Originally cultivated by the Maya of Belize as a prophylactic medicine against diseases of the Gastro Intestinal system; including ulcers, cancers and all digestive disorders as well as nematodes and other parasitical diseases. It is used by consuming the appropriate amount with meals. The active ingredients are Papain and Chymopapain, a collection of enzymes which are effective in the human G. I. to digest foods, especially proteins and fats. A crystalline proteolytic (breaks down protein) enzyme from the latex of the "Carica papaya", which catalyzes the hydrolysis of proteins, proteoses, and peptones to polysaccharides and amino acids. Used chiefly in medicine as a protein digestant. An enzyme from the latex of Carica papaya which curdles milk. Papain, contained in the plant's whitish juice, or latex, is an enzyme that breaks up protein. In its pure form, it can "digest" up to 35 times its own weight in lean meat, and so it is in great demand as a meat tenderizer. Medically, it is prescribed for people who have difficulty digesting protein and is used to break up blood clots after surgery. In addition, doctors and scientists have been studying the use of a sister enzyme, chymopapain, to shrink ruptured or slipped spinal discs. A certain amount of papain is concentrated in all the plant's juices, but the richest supply is in the leaves and in the skin of the unripe fruit. Only the latex from the unripe fruit is pure enough to make harvesting worthwhile, however, and gathering it is a labor-intensive process. Although groves of wild Papaya dot the landscapes of southern Mexico and Central America, where the plant probably originated, and cultivated forests are found in nearly every tropical area of the world, only in a few places -- principally in Zaire in central Africa -- is the latex gathered. There, field workers make shallow cuts in the skin of the green fruits with razor blades or with knives of bone, glass, or bamboo. 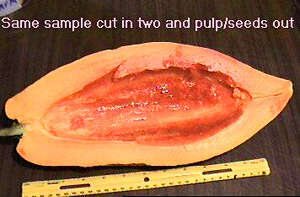 This surgical technique may be performed a dozen times or more on each fruit, the latex flow being caught in devices that look like upside down umbrellas, which are attached to the plant stems. Finally, when the crop starts to ripen or the latex supply diminishes, the harvesting season is over. Eventually, every 5 pounds of latex will yield about 1 pound of crude papain. Happily, the fruit that has been so "milked" is still edible, sweet, and juicy. If you could take a look inside of your own stomach after a large meal, you would see a biochemical battleground, pitting the good guys (the digestive juices) against the bad guys (too much food and too much fat). And the good guys are getting the worst of it. In the first place, the enzymes and hydrochloric acid in your stomach are having an extremely difficult time breaking up that mass of food. The digestive juices, which are produced by some five million glands lining the stomach, also have to work much harder on food that has a layer of fat around it. This is true food that is naturally fatty, such as sausage, as well as foods that have been fried or otherwise doused in fat. And when the gastric juices can't break through all that bulk and all that fat, they call for reinforcements and more and more juices are secreted. Unfortunately, the additional acid, instead of limiting itself to attacking the food, also attacks your stomach, and may even reach up into the esophagus, causing acid indigestion and heartburn. Eventually, if left alone, the food will slowly but surely be digested and your stomach will get back to normal. But waiting for this to happen is no pleasure. So what do you do? First of all, resolve never to overeat again -- knowing, of course, that you will. After that, start thinking about dessert. But make that dessert papaya. Papaya, besides being one of the most luscious tropical fruits, has the extraordinary ability to actually help you digest the food mass in your stomach. It does this chiefly through a group of enzymes known as papain. Among the constituents of this natural balm for bursting bellies are the proteolytic enzymes, alpha and beta papain, and chymopapain. A proteolytic enzyme is one that has a special function of breaking down protein. Chymopapain is an especially potent enzyme which helps break down all food in the stomach. However, besides the alpha and beta papain and chymopapain, papaya has several supplementary enzymes -- including amylase, lipase, and pectase. The presence of these accompanying enzymes is very desirable, because they increase the digestive activity of the main enzyme. Lipase, for example, specializes in breaking down fatty tissue, which in some cases prevents the protein-attacking enzymes from doing their work. So when papain enters the stomach, its broad spectrum of enzymes permits it to go to work immediately, and on many types of foods. It doesn't have to wait for the digestive juices to eat away one level of material before it gets down to work. Although you may have heard about papaya and papain only recently, if at all, the food industry has known about its fantastic digestive properties for years -- and has made good use of them. According to a Department of Agriculture research report, cited in a product information bulletin of Wesley Laboratories, papain helps to digest connective tissues and muscle fibers, producing a definite softening of the meat. In 1955, this work led the federal meat inspection branch to approve the use of papain on retail meat cuts. from one point of view, this use of papain saves the housewife money by allowing her to buy a less expensive cut of meat, which through the tenderizing action of papain, becomes more palatable. But there is also an important health benefit to be gained by using papain in its concentrated powder form on meat. The most expensive cuts of meat are naturally more tender for the simple reason that they have a very high content of fat infiltrating the muscle tissues. Meat like this comes from an animal which has not been permitted to get any exercise, and which has been fed very high energy food, such as corn, wheat, sorghum and molasses, instead of being allowed to pasture on grass. Inexpensive cuts of meat, on the other hand, are considerably tougher -- but healthier for you -- because they have less fat in them. They usually come from animals which have spent nearly all their lives on the pasture. We all know that lean meat is much better for us than fatty meat -- and here's your chance to do something about it. Buy the cheaper, less fatty cuts of meat and sprinkle papain on them as tenderizer. Papain retains its activity for one to two hours at extremely high temperatures, while all other plant enzymes are quickly destroyed. In fact, it seems to actually do its work while the meat is cooking, rather than beforehand. Of course, since papain is available in a number of different forms, there is no need to depend on someone else to inject it into your food. Nor is there any need to limit its use to beef. By simply eating some before a meal that you think is going to give you some trouble, papain will do its work right in your stomach. The beauty of papain as a natural digestive aid becomes even more clearly defined when this enzyme is compared to commercial antacid preparations. The latter should definitely be avoided, as they pose both short-term and long-term risks. Dehydration of food products for long term storage has to be the oldest method of preserving food. Used by just about every race of man over the entire planet, it is represented in every civilized and many primitive cultures through our entire history. Simply put, it is the drying of food. In primitive societies it was accomplished by setting the food in the sun during hot days, or smoking over a fire. In both cases the food was usually treated with salt to stop spoilage. Also, when food is in direct hot sunlight bacteria cannot survive and the toxic chemicals in wood smoke accomplish the same effect. In Belize, think of "corned" fish. This then is the secret. Slow steady drying in an atmosphere that will not allow bacteria to survive. Modern technology has improved this dramatically in the "Freeze Dried" process. Freeze drying of the food is accomplished by sublimation of water. That is where the entire process is accomplished at 40 deg. below zero, in an almost perfect vacuum, so that the water in the product to be preserved does not evaporate but sublimates. Sublimation is the moving of water from the "wet" product to the cold condenser. The water is ice at both ends of the reaction. Dry evaporation. Today we have freeze dried, irradiated food, packed in dry nitrogen, that lasts a 100 years, without spoilage. That government man I mentioned before most probably got a quote for the installation of a freeze dry plant. They cost two hundred fifty million dollars US. It is true that the normally effective, simpler methods of dehydration used in the colder areas of the planet do not work so well in the tropics. It takes 48 hours to dehydrate papaya. During this period the papaya can easily rot in the tropical environment. I have discovered a simple and effective solution to this problem. I do not wish to publish this method here though. Let me just say it uses butane gas in very economical amounts. What I would like to discuss is the product. Not only is the papaya reduced 12 times in weight, but almost as much in volume. The result is thin sheets of papaya that taste like pieces of candy. All of the medicinal properties of the fruit remain. These thin dry wafers grind easily to powder. This is called papaya "stock" which can be stored for years without degradation. When recombined with twelve times its weight of water this becomes the same fruit again as when dried, in taste if not in appearance. Think of powdered milk! Barrels of this product can be shipped very economically great distances without worry of spoilage. No need of refrigerated containers for example. Can be shipped by slow boat. The end customer could be a fruit juice bottler. There the papaya powder can be very simply inventoried until such time as the customer wishes to reconstitute it into a "fresh" fruit drink with all the properties of ripe papaya. If a person was to drink a glass of this product during his meal, it would serve exactly the same purpose as eating a slice of fresh papaya, as an aid to digestion. Powdered, dried papaya, could also be used in many recipes as a flavoring agent and meat tenderizer. It could be sprinkled directly onto meat before baking. It could be mixed into soups and stews. It could be pressed into tablets and sold as medicine for the relief of digestion problems. It can be combined with other fruit powders to make "fruit cocktails". There are almost unlimited uses for this product. But why would people use it over fresh papaya. Simple, it can be furnished at a very economical price and distributed continuously. Local papaya presently sells in open market in Belize for 20 cents US per pound. There is a loss in weight of seeds, pulp and peeling in the processing. Then there is the cost of labor involved. Then there is the costs of "racking" or handling in the dehydration stage. Further, the cost of butane and the cost of grinding. All these costs are met by including a 10 cent overhead cost. So that is 30 cents per pound US. The manufactured net cost of the finished powder is thus twelve times thirty or $3.60 cents per pound. Imagine a profit of 100 percent at the factory door -- or a selling price of $7.20 US per pound for dehydrated papaya powder. Add to this a transport charge of say a further 5 cents per pound -- to total $7.25 US per pound landed in Germany, Japan, or England. The customer is receiving the equivalent of twelve pounds of fresh, ripe, cleaned papaya. His cost for the reconstituted product would be $7.25 divided by twelve or 60 cents US per pound. Try to accomplish that kind of pricing using fresh Hawaiian Papaya, still to be seeded, peeled and cleaned. Then try delivering to Japan and watch the spoilage! This is exactly the reason so many countries are moving dehydrated food products. The proof is in the pudding. Come see me any time and I'll let you eat some dehydrated papaya. The stuff is very popular with everyone here in Corozal Town. Soon I shall be tempted to sell it on local market -- and this in the place where it grows!! Little plastic bags with a shillings worth. It tastes better than chewing gum and does a lot for your body. Remember, the sweetness is concentrated by twelve times -- people cannot believe I have not added sugar. Jacob Elias, of Camp Three, Shipyard, Belize, a Mennonite, was dehydrating local papaya for many years. He used 100 PSI steam through radiators blown by fans to dry the papaya. Normal average production was ten tons of fresh papaya per day. According to my results, that would be 1666 lbs dehydrated papaya per day. This operation closed down ten years ago when the customer ceased doing business. The product was being used for "Fruit Cake". His plant still stands and in a matter of months could be refurbished and running. Local Papaya production is sporadic. But enough could be accumulated to make a few production runs. The Papaya takes 18 months to bear fruit in quantity, averaging 150 lbs yield or more per plant. The Mennonites could easily grow almost unlimited quantities with the right financial incentives or guaranteed market for the product. I hope this puts the matter in clear perspective.